Smart houses – energy savings and cost reductions with intelligent automation systems. Within the pilot on smart houses, the partners of the Green PE project have set up a demonstration system at a house in Växjö, Sweden. Integrated into everyday life in an ordinary private household, the pilot will demonstrate the advantages of power electronic (PE)-based solutions for the energy management in smart houses. The new systems and infrastructure have been installed in addition to the standard equipment without interference and interruption of the power services. Installed on the roof, the demonstration pilot is using 20 photovoltaic (PV) panels with a rating power of 4.9 kW to generate DC power which can be used directly to run most of the electrical and electronic appliances in the house without any converter at all. This results in significant energy savings. In addition to increasing the energy efficiency, the use of a DC power system also allows a direct storage of the generated energy in connected batteries. 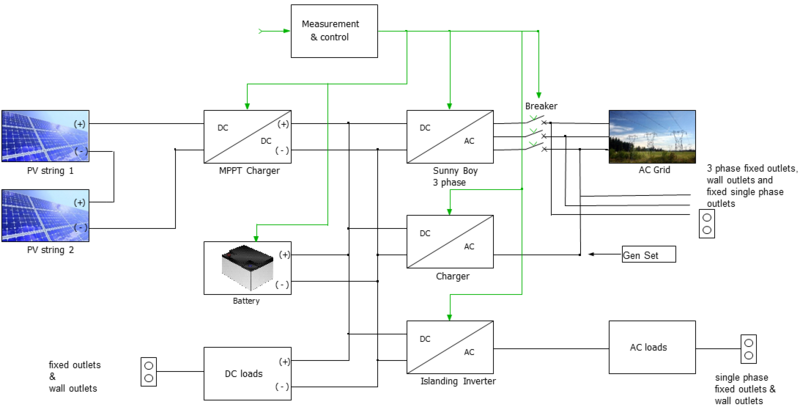 Therefore, a system for energy storage in battery packs including AC/DC and DC/AC converters/inverters is installed together with a control and monitoring system. In the diagram below, the local networks in the house are shown as one DC network and two separate AC networks where one of the AC local networks is fed only when the external AC grid is available. It also demonstrates how an external single phase AC power generator can be connected in case of longer term outage of grid feed.